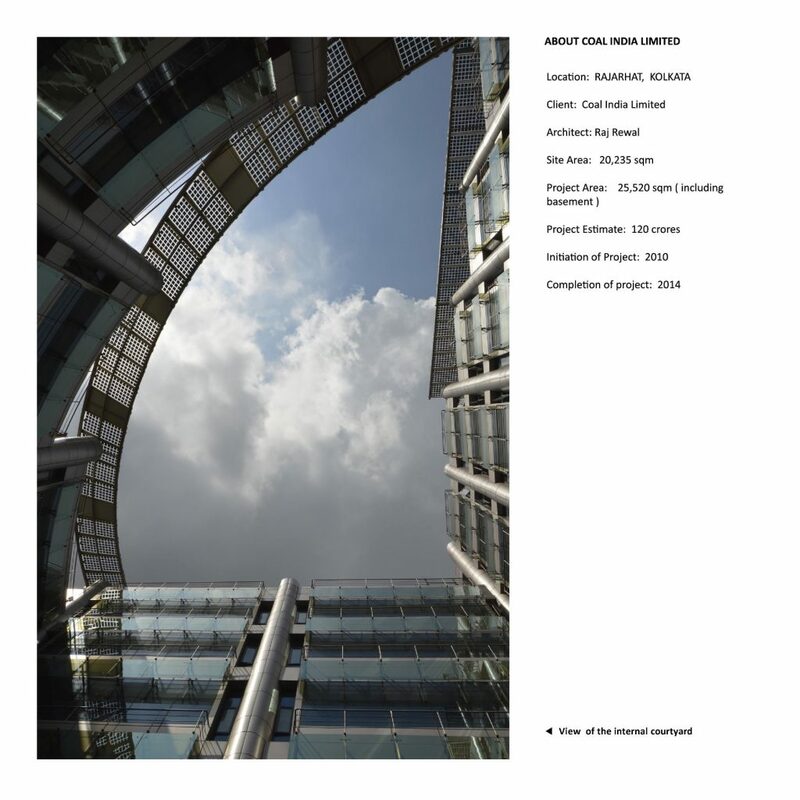 COAL India Limited, Kolkata, by Raj Rewal Associates - ArchitectureLive! Coal India ltd. is one of the world’s largest organizations in terms of coal production. Its offices are located in different parts of Kolkata and a new site on the adjoining Rajarhat area offers potential of a unified organization within one complex. The total area of the Coal India ltd. land is about 15 acres. It is a corner site surrounded by roads on three sides. Part of the site abuts a major arterial road leading to the Airport. The lease deed divides the land between office zone and housing area. The design by Raj Rewal Associates for the Coal India office complex is derived from a number of diverse ideas. Above all, its architectural expression reflects progressive values based on sustainable growth, energy saving devices and incorporation of photovoltaic panels to generate electricity. ‘Form follows sun’ to harvest the energy is an appropriate symbol for an organization dealing with coal extraction. 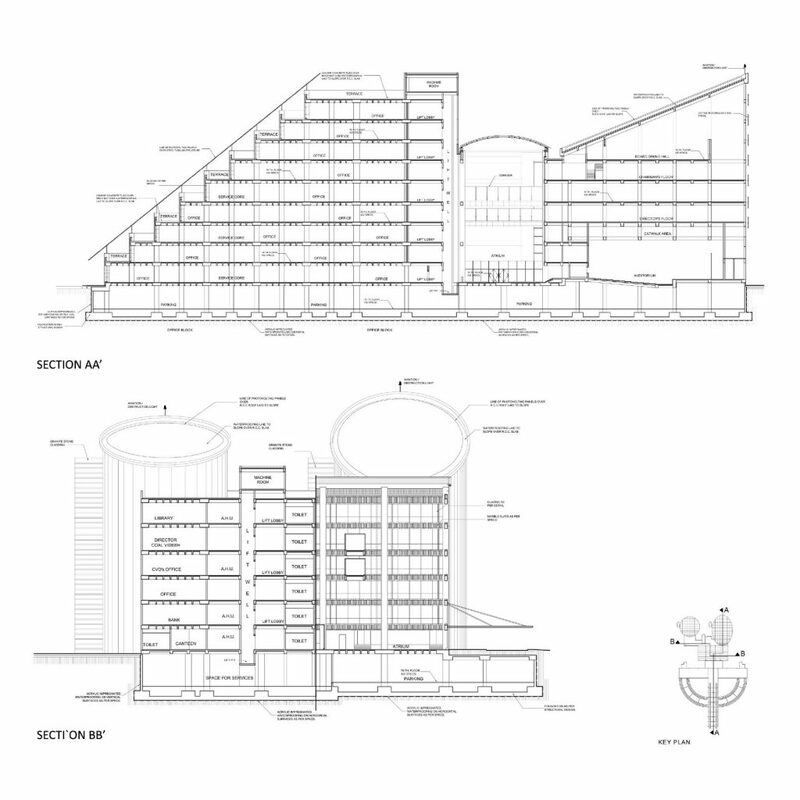 The complex has a logical and economical structural system based on distinct requirements. The system for offices is based on a structural module of a structural module of 9 meters c/c on concrete columns. As these columns are placed on the periphery, there is complete freedom for designing the interiors. The office space within each module is supported by external sheer walls. In an age threatened by global warming and carbon emission, the utilization of photovoltaic panels in a sun-drenched country is a necessity and the design is based on embracing the sun. Serious research has been done by scientists to develop solar cells that are flexible enough to be rolled around or transparent enough to be used as tints. In the Coal India complex conventional P.V cells would be fitted on the inclined roof element facing south at 22 degrees to generate maximum electricity at the cheapest possible cost. The surface on the roof is based on the requirements of P.V cells to absorb maximum energy as well as the office requirements. The stepped section of the office permits green terraces, which are shaded by photovoltaic panels. The office complex is located prominently facing the major arterial road. However the entry and exit to the office is through a side road to avoid conflict with the fast moving traffic. The office spaces are based on a structural grid that allows for flexible partitioning systems. The structural system of a typical floor is a coffered slab of R.C.C. This allows for column free large spans that can be pre- fabricated. 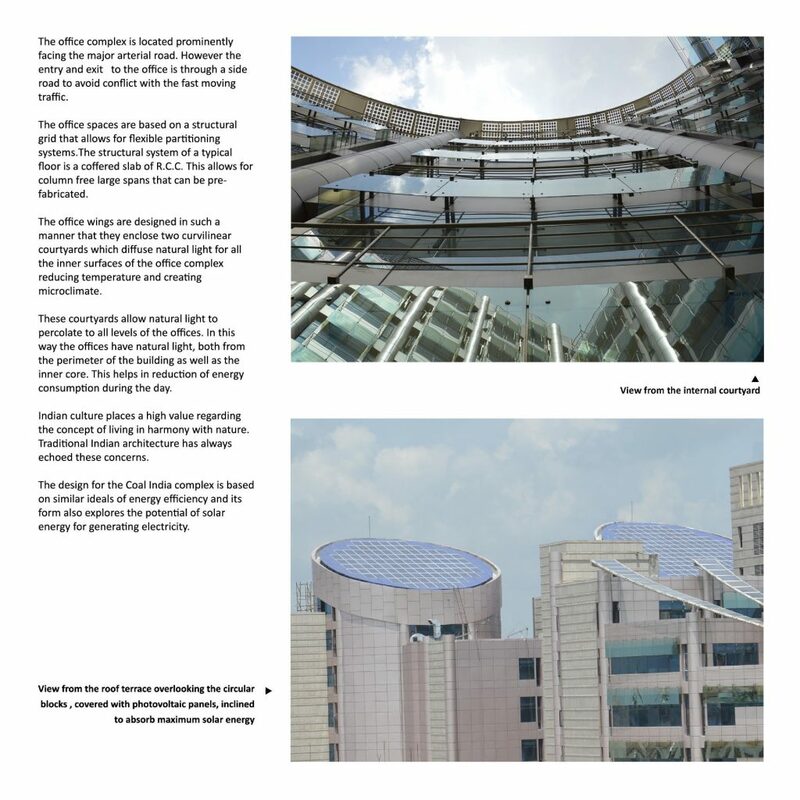 The office wings are designed in such a manner that they enclose two curvilinear courtyards which diffuse natural light for all the inner surfaces of the office complex reducing temperature and creating microclimate. These courtyards allow natural light to percolate to all levels of the offices. 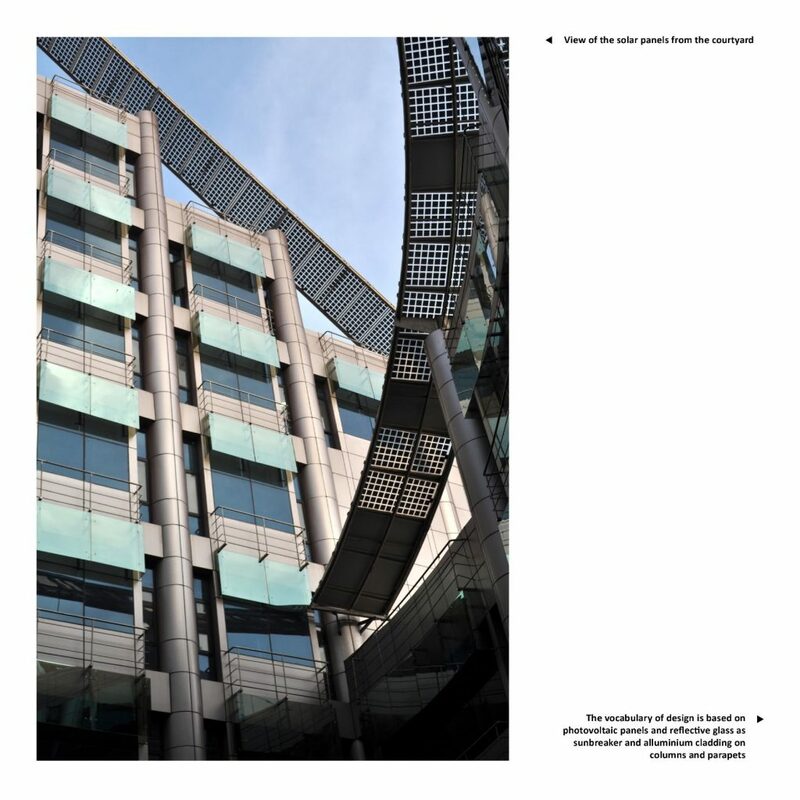 In this way the offices have natural light, both from the perimeter of the building as well as the inner core. This helps in reduction of energy consumption during the day. Indian culture places a high value regarding the concept of living in harmony with nature. Traditional Indian architecture has always echoed these concerns. 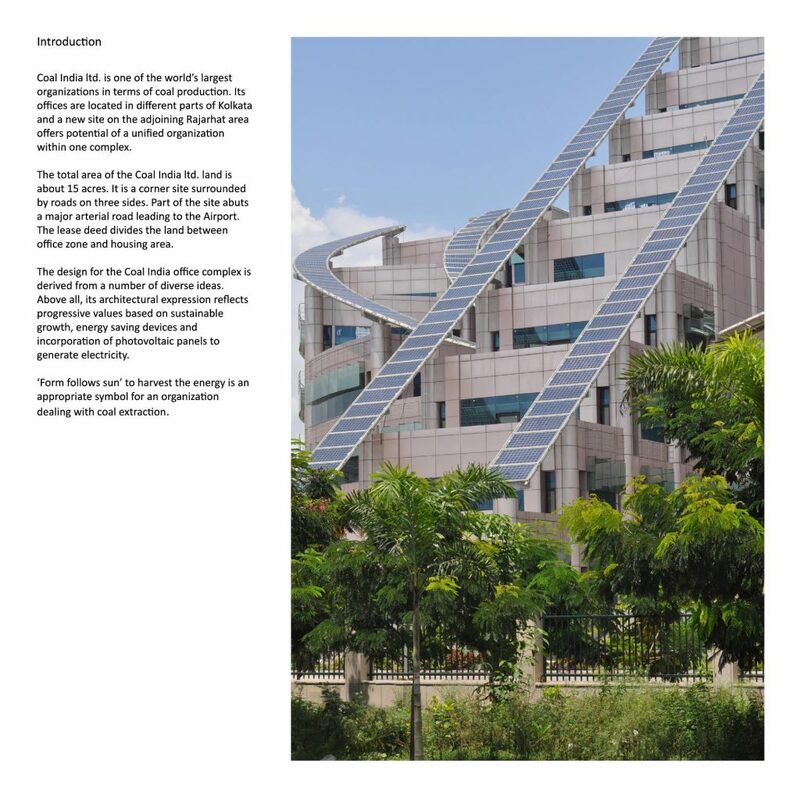 The design for the Coal India complex is based on similar ideals of energy efficiency and its form also explores the potential of solar energy for generating electricity.